Aquarium Forum > General Freshwater Aquarium Topics > South American and American Cichlids > Oscars are very playful just like puppy. Oscars are very playful just like puppy. They will often relate to the owner and the exclusion of everyone else. They are also like a two year old in that they will sulk at things not going their way. It is not unusual for Oscars, unhappy about something, to lie on their side on the bottom of the tank until they feel they are getting things their own way again. They will unmercifully harass and bully weaker and smaller fish, but will often wimp out against opponents of similar size and nature rather than stand up to them. I took my 2 "Albino Oscars" out and transferring to their house tank. They seemed more comfortable. They are happy just like puppy. They are about 9 months old by now. Perhaps the most endearing thing about Oscars is their personality. Oscars are the closest thing you will get to a puppy. They will play with anything else what I have left there in my aquarium. I noticed that they will knock it down anything what I have like water filter running with a long black plastic tube. I didn't realized for what they do. They are very playful just like puppy. So I thought about them. For next few days as I decided to search something to buy a toy for them to play with it. I bought a nice plastic round ball with a mirror hanging down. Surely that will help for them to play with it while I was away to work. I found it was from my local pet store nearby. (LFS). Re: Oscars are very playful just like puppy. You know, I feel the same way about my red hawkfish. It has a peculiar, charismatic personality, which I fall in love with. All of them are my favorite cichlid fishes. They are just like my best friend as children of course! I couldn't do without them. Can't help myself! LOL!! How long will they (Oscars) grow to get bigger? In a one or two years? I would say skip the 30 gallon tank, mine grew from a little over an inch to 6 inches in a matter of months in a large aquarium. A thirty gallon tank for a fish already 3.5 inches will be tight. Oscars are VERY dirty fish and will destroy the balance of a tank, the bigger tank is a must. The larger tank will also prevent ammonia reaching toxic levels as fast. Put together the tank and keep a dozen small goldfish feeder fish in it for a few weeks to help start the bio cycles and then begin preparing for an oscar, it takes months to properly establish a tank, and a newly prepared tank will not support the oscar well. However my black convict cichlids do well work hard to clean up the mess of the wasteful fish foods on the bottom. When my Oscars do spitted coming out from their mouths as I noticed that my black convict snipped real quick of the jumbo carnivore sticks with the small chip bites. Not to say that it cannot be done, it will just be difficult to do, my nitrogen levels will be all over the place for a long time and will not be terribly forgiving. I will need to closely monitor the water balance and be ready for frequent water changes to keep the fish waste from becoming toxic. Recently to measure them on my 2 Oscars. They are 5 inches now. I bought them last spring time. Doesn't take very long for them to grow so fast. Finally my long time a good friend referred me to try that product from Amazon. Then afterwards I pondered thinking on my mind. So then I decided to order it right away. Can't wait to get it about 2 weeks. I think that is a great idea product called, "Eheim Quick Vac Pro Automatic Gravel Cleaner and Sludge Remover". I told my friend that I wanted to save my money by reducing the amount of additives needed for water maintenance. No buckets or hose siphon required to change the water. Just insert the suction end into the gravel. The water suction lifts the waste up and deposits it into the super-fine mesh cartridge. Quick cleanings are done in minutes. Super fine mesh cartridge traps even the smallest waste particles while letting water back into your aquarium. Remove wasteful of the fish foods and my two Oscars' feces before it has a chance to break down and pollute the aquarium water. Last night I changed the water to start over again to get the clean fresh water maintenance with the amount of additives in my aquarium. Very easy to catch my "5 inch friendly Oscar to put in the large net to transfer in the big pail with the fresh clean water with water conditioner. And again to catch another one too! Seemed that my two Oscars are very playful and easy/slow motion swimmer to catch. I am looking forward to receive my order soon. I will update. See what happens with that new product of "Eheim Quick Vac Pro Automatic Gravel Cleaner". Hopefully if I would be success that would be no more water changing. I will try that one! How I feels about this??????? sounds great! Keep updating and also we love photos! 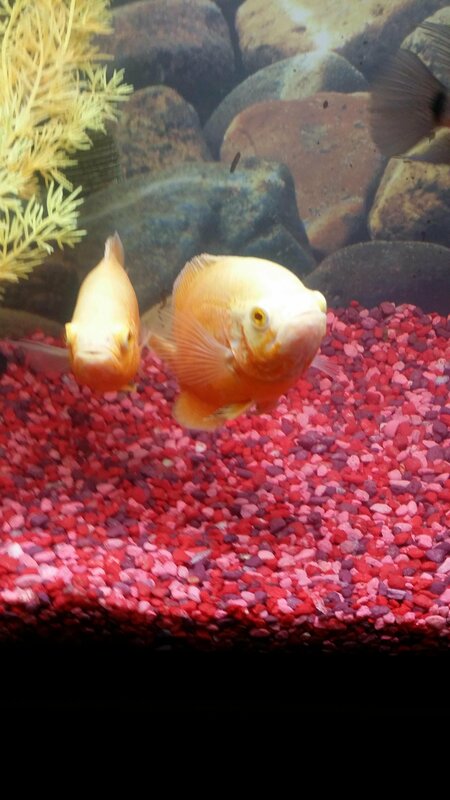 Two Red Lutino Oscar Cichlid fish. "Eihem Quick Vac Pro Automatic Gravel Cleaner and Sludge Remover". I tried this three times cleaning gravel significantly easier and more quicker to remove the wasteful dirty debris in the gravel. There's no needed water change and hassle free cleaning. It does have included battery. Amazingly it does work better than ever. Oscars seemed so happy to keep their water stay clean and healthy. I am so happy for them too! ?